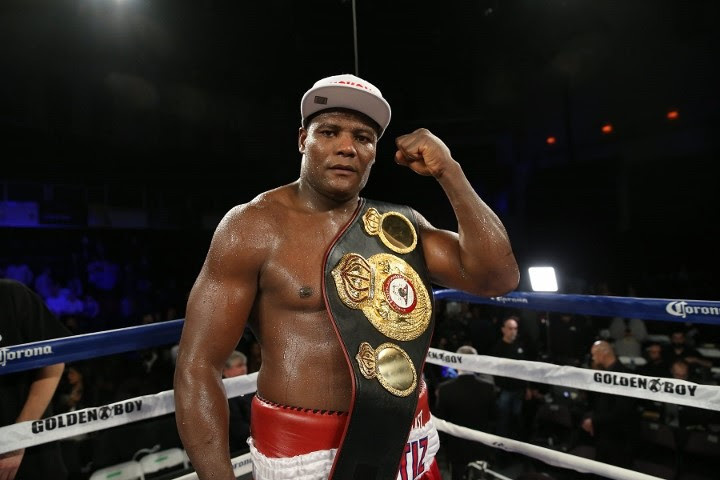 Luis Ortiz - Joyce's next opponent? The heavyweight division continues to be an ever-interesting landscape with a seemingly fresh new outlook given all the shake ups that have taken place over the past few years. For years, boxing fans became accustomed to seeing the Klitschko brothers, older brother Vitali and Wladimir, reign supreme and share titles atop the division. But with each Klitschko’s inevitable retirement, so too did the doors open for a bevy of potential new stars who are now making an impact in the sport. One of those men, WBC heavyweight champion Deontay Wilder, has risen to near the top of the ranks of the heavyweight division. Depending on who you speak with, some consider Wilder the man to beat in the heavyweight division. And to anyone who doesn’t feel such a mantle belongs to Wilder, they are liking pointing to IBF/WBA champion Anthony Joshua as the heir apparent. And while Wilder vs. Joshua would be a scintillating fight, each man is lined up with another opponent for the moment. On March 31, Joshua will face off with WBO champion Joseph Parker, while earlier in the month, on March 3, Wilder will face off with former interim WBA champion Luis Ortiz in a very dangerous match. Actually, both fighters are lined up with a tough fight, but it is the power-punching Cuban, Ortiz, who may have the best shot at spoiling the show. It’s true that Ortiz was lined up to face Wilder this past November and saw the fight dramatically fall apart after he failed a pre-fight drug test. Prior to to that, the boxing world was buzzing for the matchup to take place. It’s a sure-fire entertaining duel no matter how you look at it, given each man’s great physical abilities and the power they both possess. Wilder is 39-0 with 38 knockouts while Ortiz is 28-0 with 24 knockouts. Ortiz had another issue with drugs in the past, as he tested positive following his 1st round knockout over Lateef Kayode in September of 2014, as the fight was later changed to a No-Contest. Fans cried foul when Ortiz tested positive prior to the Wilder fight, but he has another opportunity right in front of him. Whether or not you like Ortiz, there is no doubt that he is a dangerous opponent. Perhaps the best case of this was his impressive 7th round TKO over the very game Bryant Jennings in December of 2015. In that fight, Ortiz overwhelmed Jennings and showed his power. As for Wilder, he has been the fighter who has been on more of a hot streak, as he is even coming off of an electric 1st round knockout over former champion Bermane Stiverne in their rematch this past December. Wilder dropped the hammer on Stiverne with a big right hand that scored a knockdown, and followed it up with two more knockdowns to close the show in what may have been the year’s biggest knockout. Prior to that, Wilder had been dying for a high-profile opponent. The two men’s willingness to face off with one another, as seen following Ortiz’s knockout over Daniel Martz in Miami last month, where they traded barbs in the middle of the ring, showed us that this is a fight that could be special. On paper it’s power vs. Power, but you have to favor Wilder, simply because he has fought a higher level of opponent, looked in better form lately, and also been far busier in recent years. It’s a dangerous fight, but one that appears to lie in Wilder’s hands.